The Centre for Plant Protection is a part of the Croatian Agency for Agriculture and Food. Centre provides scientific and professional support to the responsible authorities (Ministry of Agriculture) regarding plant health and diagnostics of plant pathogenic organisms. Our team main interests are plant pathogenic phytoplasmas and their interactions with plant and insect hosts. Our goal is to generate knowledge on distribution and incidence of phytoplasmas by combining field-oriented and molecular tools. Main research topics of our team are epidemiology and phytoplasma-host interactions. Focus is mostly on the flavescence dorée and the bois noir phytoplasma diseases of grapevine but also on european fruit tree phytoplasmas. Our team is primarily oriented on the detection of infected plants and insect vectors and their distribution, identification of phytoplasma plant reservoirs and their role and finally influence of native or introduced insect vectors on the phytoplasma epidemiological cycles within the investigated environment. Our current primary research topic is the characterization of flavescence dorée disease with regards to FD phytoplasma (FDp) influence on local viticulture and especially indigenous Vitis vinifera varieties. We are also involved in creation of national application for tracking of FDp. We aim to determine the genetic variability and strain composition of FDp population structure by multilocus sequence typing (MLST) typing approach. By distinguishing different and distinct plant/genotype/phytoplasma/insect vector combinations it is easier to understand their epidemiological relevance and mechanisms involved in geographical distribution. Our long-term objective is to determine the propagation pathways of phytoplasma strains through epidemiological studies and to predict their epidemic potential in order to improve control tools and to develop effective and sustainable strategy to contain phytoplasma infections. 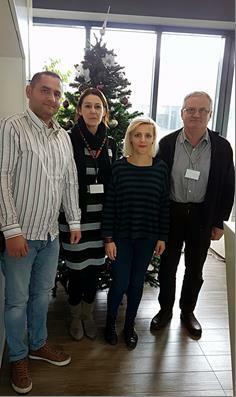 Most of our research activities were carried out in close and long-standing cooperation with Faculty of Science, Department of Biology, Division of Microbiology (Zagreb). Within our close collaboration we hope that some other research topics will also be addressed in the near future. Plavec, J., Budinšcak, Ž., Križanac, I., Škoric, D., Šeruga Music, Martina. (2016). Stamp gene as the highly discriminative marker for assessment of BN variability in Croatia. Mitteilungen Klosterneuburg, 66; 46–49. Šeruga Music, M., Škoric, D., Haluška, I., Križanac, I., Plavec, J., Mikec, I. (2011). First report of Flavescence Dorée-related Phytoplasma affecting grapevines in Croatia. Plant Disease, 95 (3): 353.